We will be posting the new total for the Build a School project soon, but in the meantime we would like to send a message to Ingrid and Anouk from Stuttgart. Your packet has arrived at our office safely and we are working on posting your story to our website. Thank you. There are several new designs at our Happy Chinese New Year Contest page. We now have 55 entries, which means that no one else will receive a gift for sending in a design. However, you are still eligible to win one of Jackie's own t-shirts, so send your drawing in before February 7th to enter the contest. Please follow the guidelines here for entering our contest. Look at the beautiful Buddy Bear Petra made in honor of the original "Teddy Bear" which has been around for over one hundred years. This time it's an old fashioned "Button-in Ear" Teddy, like most of us had one in our childhood. 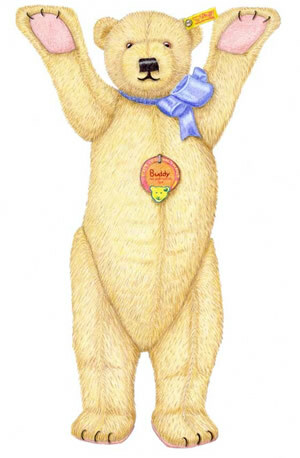 Doing some research for the Buddy I found out something interesting: Did you know that the handicapped Margarete Steiff created her first Teddy bear in 1903. She sold most of those bears to the US. 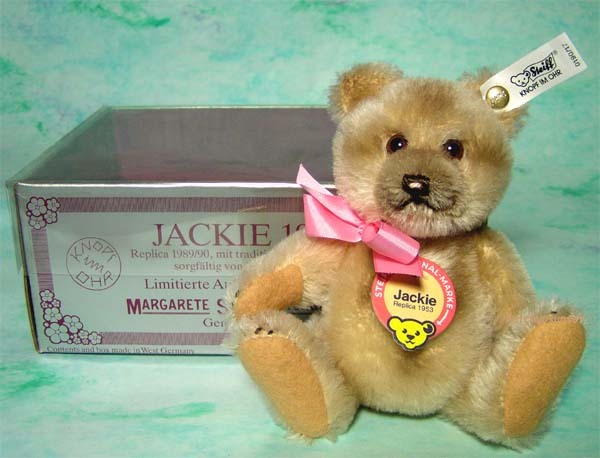 In the year 1953 her company made a 50th anniversary bear by the name "Jackie" ! 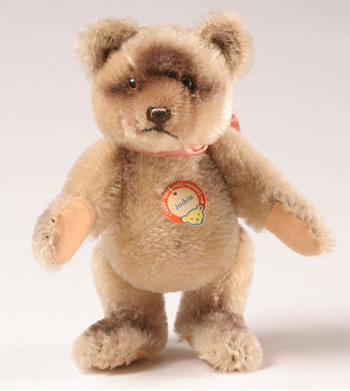 Here is a photo of the original Steiff Jackie bear. This bear sold at an auction in 2007 for US $2,100. Thank you to Petra for sharing her beautiful drawings with us here at the Kids Corner. 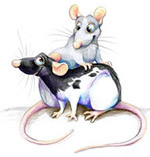 Petra does all of our cartoons voluntarily and we really appreciate her! A few more designs have been added and we're nearly out of prizes. However, remember that even after the 55 prizes are gone, you can still win one of Jackie's t-shirts! So hurry and send in your design. Several people have sent in stories and photos for our Sharing Corner in the past few months. Please be assured that we have not forgotten about you! We have your photos and stories here and will post them as soon as possible. We also have a few odds and ends to share with everyone and will continue to work hard to get everything up onto the website. So even if you sent something a few months ago, don't worry -- we'll get it posted. 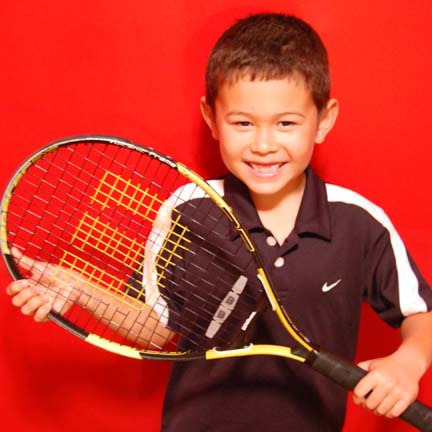 We've prepared a web page at our Build a School helpers section for Dylan's Tennis Challenge (click on link, below). If you haven't read about what this little guy is doing, you should drop everything and read it now! Dylan's Challenge will take place in May, so there will be plenty of time to make a pledge and we will post reminders here every so often. More designs for Jackie's Happy Chinese New Year contest have been added today. Now we have a total of 45 drawings; that means there are only 10 more gifts left, so hurry up and send yours in! We were delighted to read some great news about a little boy in California who came up with a clever idea to raise money for Jackie's Build a School for a Dollar project. Dylan Stoutenburg is a seven year-old fan from Los Angeles, California who read about the project at our website and wanted to think of some way to help. He's an avid tennis player and has been involved in fundraising efforts before, and he came up with the idea of challenging himself to make 100 tennis serves at a local tennis court to raise money. He is recruiting sponsors to pay for each fair serve he makes. His personal goal is to get at least 50 of the serves in fair territory and his goal for the fundraiser is to raise over $1,000 for the Build a School program. As soon as we read about Dylan we called his organization to encourage and thank him. We will keep you posted on the progress of Dylan's fundraising and hope that you will support him. You can read the whole story here. We hope that Dylan's story will encourage other youngsters to get involved in our project. Dylan proves that you're never too young to make a difference. With a good idea and the support of the adults around them, kids of any age can help Jackie achieve his dream of an education for all children. Thank you Dylan! Here is the email address where you can pledge money for Dylan's fundraiser. We've added a small informational page about the Dragon's Heart logo. Click here to read about it. Also, the men who made the bicycle ride from Shanghai to Hong Kong have sent us a report complete with gorgeous photos of China. Click here to read about their trip and get the link download the .pdf file of their report.